MMA And Bodybuilding: Do They Mix? Exercises & Workouts Included! The most common question asked by aspiring MMA fighters is whether they can train like a bodybuilder and still get results from their MMA programs. Get a detailed list of exercises and sample workouts for beginners. Learn more right here. One of the more common questions asked of me by aspiring MMA fighters is whether they can train like a bodybuilder and still get the kinds of results they expect from their Mixed Martial Arts programs. This is an interesting question because on the one hand we all know that much strength is needed to dominate the opposition, but on the other, it is often thought that too much size can be a limitation - or can it? Another possible dilemma faced by MMA fighters who want to incorporate bodybuilding into their routines is recovery. How much weight training is too much? To gain the type of strength and power needed to submit your opponent or to strike with tremendous force, resistance training is a must. What many are unsure of, though, is how it can be balanced with regular, specific MMA skills sessions, which include sparring and various drills, and the all important cardio component, to increase power, strength and size and allow for sufficient recovery time. Some might argue that resistance training is unnecessary for MMA purposes. Just stick with sports specific training and plenty of endurance work and you will defeat the opposition with speed, skills and fitness they say. Although it is largely an old-school mentality, this belief still persists today. As a personal trainer who works with many fighters I am still constantly asked whether weight training will make a fighter "muscle bound" and decrease their speed and flexibility. Actually nothing could be farther from the truth. Done correctly, various types of resistance training will actually increase speed and enhance flexibility in addition to providing valuable core stability and the aforementioned strength and power. As a combination of strength and speed and the rate at which work is performed, power by its definition can be viewed as an essential requirement for any MMA athlete. Strength - a component of power - as the ability to exert force on an object is likewise a major facilitator in athletic performance. And weight training is the single most effective way in which to develop both power and strength, a fact not lost on the current crop of MMA champions, all of whom incorporate resistance training into their routines to some extent. And resistance training, like it or not, will, in addition to enhancing its performance, change the way the body looks: the muscles will get much larger - bodybuilding in effect. Enhance Performance & Build Muscle. Take a close look at the physiques on MMA competitors of the late 1990s and beyond and it is clear to see that these guys take weight training seriously. Indeed, many, especially at the professional level, train with expert strength coaches to get the edge in this department. It is usually the up and comers, those at the beginning level, who still struggle to comprehend the value such training provides. Look at the physiques of Ken Shamrock, Tito Ortiz and, even lighter guys like Matt Hughes, and it is obvious their physiques are a by-product of the specific power and strength training they do to compete at the highest level. However, such fighters have the luxury of expert trainers and additional recuperation time. So what is the amateur fighter to do? A number of factors need to be considered when planning for overall MMA performance (recovery ability, time availability and access to facilities and expertise being main ones). One thing is clear though: weight training should be included at some level. With recovery and time availability in mind this article will provide exercises, along with relevant training protocols, and workouts that will add much needed power to your MMA performance. The training advice included can, with some tweaking, also be used by professional fighters to enhance their game, but the exercise scheduling and session duration is planned with the up and comer in mind. Core training is thought to be one of the most important training requirements of benefit to athletes and non-athletes. Benefits and sample training workouts of core training for MMA fighters any average person follow. Considering the extensive range of skills MMA athletes need to successfully ply their craft, time is of the essence when it comes to planning specific MMA weights sessions. The exercises selected should be as relevant as possible and, as such, the best movements for enhancing an MMA fighter's power and strength should be those that most closely resemble the movements they will use in the Octagon. Considering the same criteria, exercise selection should also be based on compound movements that work many muscles at one time (no one-arm-preacher-curls here!). 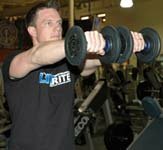 The following exercises, upon which this article's suggested program is based, are both specific to a fighter's ability to execute the skills they train for and timesaving as they work multiple muscle groups. As far as developing overall muscle power nothing really comes close to the clean and jerk, which can be done two ways (the dumbbell version will be explained shortly). Although the dumbbell method is a an excellent choice, the barbell clean and jerk remains the No. 1 movement for developing power (which is translated to explosive speed in a fight) and strength throughout all the main muscle groups. This movement requires the coordination of the legs, back, shoulders, arms, chest and abs to be done correctly - and stability and neuromuscular efficiency are key benefits to performing it. Specific to MMA performance this exercise helps a fighter maintain a stable position in the clinch and provides the strength to change their positioning in this situation to gain the advantage. Given it enhances the coordination of all the major muscle groups, it is also useful for improving power and endurance throughout any punching and kicking technique. Given its amazing benefits, the clean and jerk (alternating the bar and dumbbell versions) will be featured in each of the two weekly weight programs given here. Squat into position and gasp the bar (keep face forward and back straight). Swing the bar to shoulder position in a controlled manner while straightening the legs (keep a slight bend to the knees though). 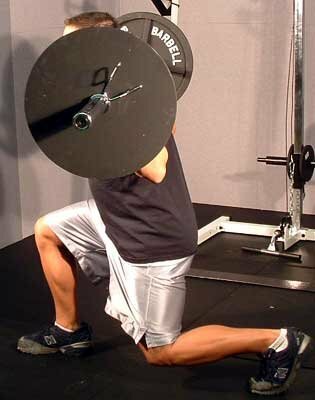 From shoulder position squat down slightly before pushing the weight overhead for a full extension while breathing out. Hold this position for two seconds before slowly lowering the bar back to shoulders, then to the floor (basically reversing the movement, again in a controlled fashion). This exercise provides similar benefits compared with the bar version. However, it does have particular merit. It is harder to perform, therefore requires less weight. In this respect it may not be as effective for establishing the same degree of explosive power but it will improve coordination and neuromuscular efficiency just as well. It is included as it provides an additional challenge, variety and requires greater demands on the shoulder muscles and joints thereby developing endurance in this area. Follow the instructions given for the bar version, but keep the dumbbells slightly inside the legs before execution and swinging them up from this position. Second only to clean and jerk as a total body movement, deadlifts force the whole body to work and create tremendous strength and power in the entire back (lats and, in particular, erectors) and posterior chain. Once again this movement will aid stability and enhance power throughout the entire body. With feet two to three inches or so wider than shoulder width, grasp bar (with an under/overhand grip or and overhand grip with straps) with knees bent and back straight. Push off from the floor with feet, pulling the bar in line with the shins while pulling shoulders back until bar touches the upper thighs. Reverse the movement to start position and repeat. 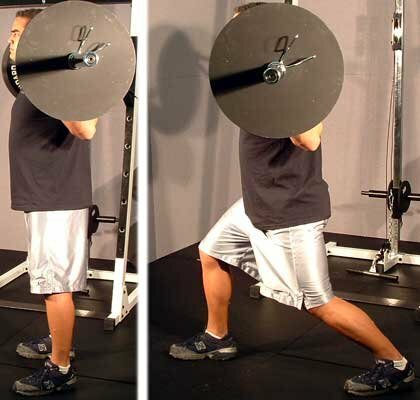 Although the clean and jerk does necessitate a squatting motion, squats offer a more pronounced stretch and contraction in the legs and specific emphasis on the development of thigh and hamstring strength and power. They remain the number one overall leg builder and come second only to deadlifts and the clean and jerk as a total body developer. Of particular interest to MMA fighters (who all require a lower center of gravity when wrestling), the squat provides tremendous core stability and strength from a low position, especially if it is performed over a full range of motion. A good punch is often a product of the interplay between strong legs, a supple waist and good hip range of motion and the squat will enhance all three. Stand under a racked bar, placing bar on the middle part of the trapezius muscle (not too high and not too low). Walk out of rack and place feet at around two inches wider than shoulder width with feet angled out slightly. Squat to below parallel while maintaining a straight back - keep head facing forward (not too fat up or down). Push away from the ground with feet (imagine them driving through the floor) to return to starting position. Continuing our theme of core stability and strength, the good morning is probably the best lower back developer in existence (it also increases strength and power in the entire posterior chain - the series of muscles that comprise the rear of the physique). In an MMA match it is inevitable that one will encounter an attempted takedown or have to fight their way out of, or dominate, a clinch. To successfully navigate any of these possibilities requires strong lower back muscles. 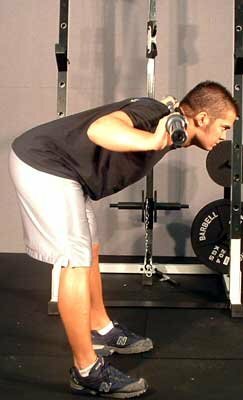 Since the good morning requires a weighted descent to a bent position parallel with the floor, it encourages and enables the athlete to hold this position for an extended period. This WILL happen in a fight. Place bar across back as per the squat. Looking straight ahead, bend to a position parallel with the floor while keeping back straight. Hold position for one second before returning to the starting point. Of all the movements featured in this program, the standing straight-arm dumbbell press would be most specific to the punching motion required in MMA competition. In my experience in training fighters, this exercise has proven to be the most beneficial in terms of enhancing endurance and speed in the arms and shoulders. It also develops great strength and power. This movement will work the shoulder, chest and arms primarily. While standing grasp dumbbells (will need to go light initially) and bring them to a front raise position, with arms stretched outward. 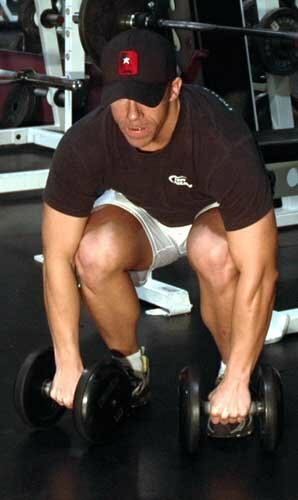 Bring one dumbbell back to chin while keeping the other extended. Alternate this position in a punching motion while keeping the hands straight in a pronated position (hands down). Great for improving chest, shoulder and triceps strength and power, the Swiss ball press-up will also target various supporting muscles and enhance stability. Of all the exercises for chest and shoulders this one would most closely replicate the unstable environment encountered in MMA competition. As the ball moves it will be your job to keep it in the correct alignment to successfully complete the movement. 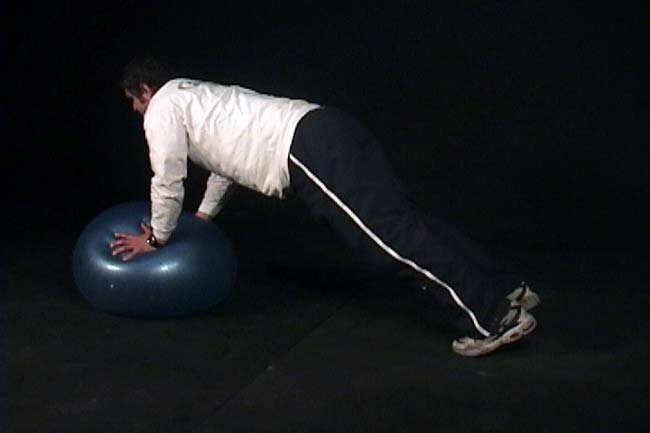 Place hands on Swiss ball about shoulder width apart while balancing on feet in a push-up position. Slowly bring chest toward ball while keeping hands in a fixed position-Push back to starting point. Lunges are an excellent way to enhance flexibility in the hamstring/glute tie-in and quads, which will increase kicking height while enhancing speed and power throughout. 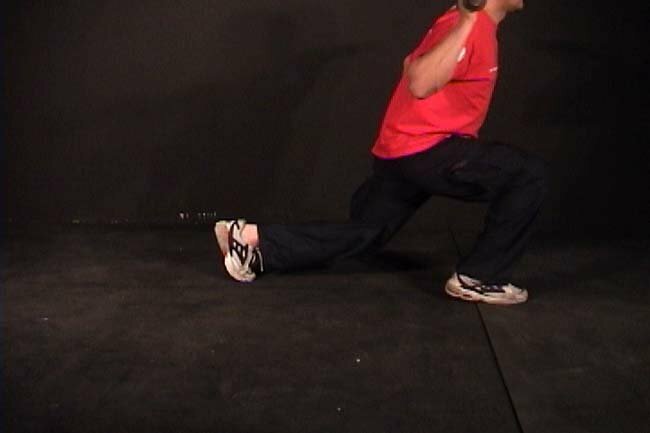 The regular variety shown here and featured in workout two of this program will target more explosive power as there will require a greater push off with the front foot as it returns to the starting position. This version therefore would be best for kicking power and speed. Position bar as per the squat. Take a long step out with one leg so front knee is aligned directly over heel. Drop back knee straight down so it is almost touching the floor. Use front leg to push back to starting point. Walking lunges (as suggested in workout one) will greatly improve anaerobic endurance. They involve more of a fitness component compared to standard lunges. When your opponent struggles to remain on their feet in the final rounds, your capacity to generate more force in the legs may be the deciding factor. Due to the dynamic nature of this exercise, greater momentum will be added to all leg techniques. This means more forceful execution in the MMA arena. Instead of pushing front leg back to starting position stand while bringing rear leg forward. Continue in a walking fashion. Given recuperation is vital to MMA performance, one of the most important things to consider when planning any training system is workout scheduling. The following weight training workouts are based on the assumption that the athlete is training specific MMA skills three times a week - the average schedule for an amateur fighter. Any given MMA session will encompass sparring, drills, shadow boxing and bag/pad work (all fundamentally important as these will develop the precise energy systems needed throughout and actual fight) and weight sessions will be done as an adjunct to these sessions. Heavy Bag Training. Strategies And Programs. The heavy bag is a tried and true piece of equipment that has helped many professionals. In addition the kind of workout you can get from it is amazing. Therefore weight training will take place twice per week on non-specific MMA training days with two days in between weights sessions. Walking lunges: three sets of 10 per leg (20 in total). Squats: three sets of eight to 15. Swiss ball press-ups: three sets of eight to 12. Dumbbell clean and jerk: three sets of 6 to 8. 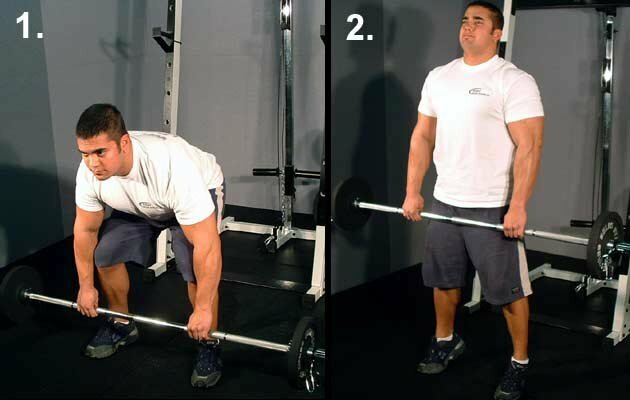 Deadlifts: three sets of 8 to 12. Good mornings: two sets of 6 to eight. Standard bar lunges: three sets of 8 to 12. 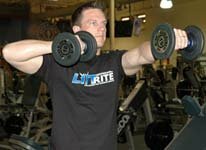 Standing straight-arm dumbbell presses: three sets of 10 with each hand (20 in total). Athletes and, in particular, coaches need to continually be aware of the possibility of overtraining. A simple method is to gauge how tired the athlete is. If tiredness persists for more than two days it is a good sign they are overtraining and additional rest will need to be prescribed and/or the program will have to be modified accordingly. Lowering the number of sets in weights sessions can be done if this is the case, although intensity should still be kept relatively high. You will note that there are only two weights sessions per week in this program. Given the nature of the exercises (compound; total body for the most part) and the extensive training that comprises regular MMA training, any more than two resistance days may cause overtraining. Sets and reps are also moderate for this reason. With all exercises in this program an emphasis must be placed on strict form and good control since they are mostly multi-joint movements and the potential for harm is greater compared to isolation work. No bouncing or exaggerated swinging. A slow descent (lowering) and a slightly more forceful ascent are advised. All things being equal, a stronger, more powerful MMA fighter will dominate over one who is not as developed in these areas. All of the exercises in this program combined will enhance MMA performance by building strength and power through the entire body while conserving energy - no movements are wasted as pure isolation exercises are omitted. A Stronger, More Powerful MMA Fighter Will Dominate. With today's emphasis on well roundedness, a fighter cannot overlook the importance of weight training. With the help of this article your strength and power bases will be well covered.